23,600 students from 480 Irish secondary schools take part in Student Enterprise Programme through the Local Enterprise Offices every year, bringing the world of business into the classroom. Some of the county’s most enterprising teenagers are ‘counting down’ to the Student Enterprise Programme National Finals on Wednesday, May 2nd in Croke Park. Intermediate Category Winners in the Student Enterprise Programme County Final from Cólaiste Dún Iascaigh, Cahir photographed from left to right: Sinead Carr, Director of Services, Tipperary County Council, students Morgan Lambert, Sean Cunningham, Cian O’Brien and Callum McGrath with Cllr Roger Kennedy. Starting every September, students across three age categories (Junior, Intermediate and Senior) research, set up, and run their own businesses with the help of their teachers and supports from Local Enterprise Office Tipperary. Nationwide, 230 students from 77 different student enterprises have now reached this year’s National Finals, having qualified through school and county finals earlier in the year. Working under the guidance of Martina O’Reilly from CBS High School Clonmel, the Junior Category finalists are: David Kennedy, Oisin Dillon-O’Rourke and Jack Egan. The students have developed educational jigsaws and a fun filled memory board game for all the family. In the Intermediate Category, the students competing in Croke Park under the guidance of Martina Harrahill from Coláiste Dun Iascaigh, Cahir are Morgan Lambert, Sean Cunningham, Cian O’Brien and Callum McGrath. These students have designed a safe and hygienic way to store and save gumshields from getting lost. And finally, Dylan Murphy, Billy Howard, Darragh Spillane and Cathal Spillane are competing in the Senior Category, under the guidance of Laura Young from St Joseph’s CBS, Nenagh. These students are solving the problem of sun glare distracting hurlers on the field of play with their innovative helmet visor. Run by the 31 Local Enterprise Offices in every local authority area, the Student Enterprise Programme is the biggest enterprise education initiative of its kind in the country, with 23,600 students taking part every year from 480 second-level schools. Funding for the programme is provided by the Government of Ireland through Enterprise Ireland, and since it started in 2003, over 150,000 students have now taken part. The special guest at this year’s National Final is the Minister for Trade, Employment, Business, EU Digital Single Market and Data Protection, Pat Breen T.D. 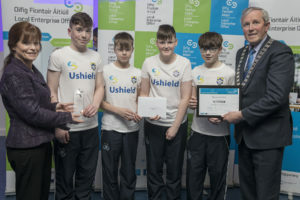 Last year’s Senior Category nationally was won by ‘ROC Protection’ from Clonkeen College in Dún Laoghaire-Rathdown, with a protective base layer for hurling and camogie players. The 2017 Junior Category winner was Blathnaid Murphy of ‘Daisy’s Pawesome Bowties’ from Our Lady’s Secondary School in Louth, and the Intermediate Category winner was Cillian Scott of ‘Scott Engine Tables’ from Coláiste Chill Mhantáin in Wicklow. Further information about the Student Enterprise Programme is available from www.studententerprise.ie, with free resources available for teachers and schools.